A spacious three bedroom mid terrace family home located in a cul-de-sac with Greenhithe railway station and Bluewater Shopping Centre located close by. The property is perfect for those that want to add their own style to a very well proportioned house with accommodation comprising of a lounge, fitted kitchen opening to a dining room and a cloakroom all to the ground floor. Upstairs you will find two double bedrooms, a large single bedroom and a family bathroom whilst outside there is a rear garden with a brick built shed. There are plenty of features including double glazing, warm air heating and the property is offered chain free. From our Clifton & Co Dartford office proceed around the one way system into East Hill and continue into Watling Street. Go straight across the mini roundabout and take second exit off next roundabout into The Brent. Continue into London Road, proceed to the next roundabout and go straight across (this is a continuation of London Road). Take third turning on the right into Knockhall Road and Ingress Gardens is the first turning on the left hand side). Part glazed door. Carpet. Stairs leading to first floor. Cupboards housing boiler and meters. Telephone point. Double glazed window to front. Low level flush W.C. Wash hand basin. Local tiling to walls. Carpet. 13' 1" x 11' 8" (3.99m x 3.56m) Double glazed window to front. Carpet. Coved ceiling. 12' 5" x 8' 8" (3.78m x 2.64m) Double glazed window to rear. Double glazed door leading to garden. Wall and base units with roll top work surfaces over. Stainless steel sink unit. Cooker point. Plumbed for washing machine. Vinyl flooring. Radiator. Tiling to walls. Coved ceiling. 11' 8" x 11' 1" (3.56m x 3.38m) Double glazed window to front. Carpet. Coved ceiling. 11' 8" x 10' 1" (3.56m x 3.07m) Double glazed window to rear Built-in wardrobe. Airing cupboard. Carpet. Coved ceiling. 8' 9" x 8' 2" (2.67m x 2.49m) Double glazed window to front. Carpet. Coved ceiling. 7' x 5' 6" (2.13m x 1.68m) Double glazed window to rear. Panelled bath. Wash hand basin. Low level flush W.C. Vinyl flooring. Local tiling to walls. 25' x 21' 6" (7.62m x 6.55m) Patio area. Lawn area. Brick built shed. she with power and light. Rear pedestrian access. 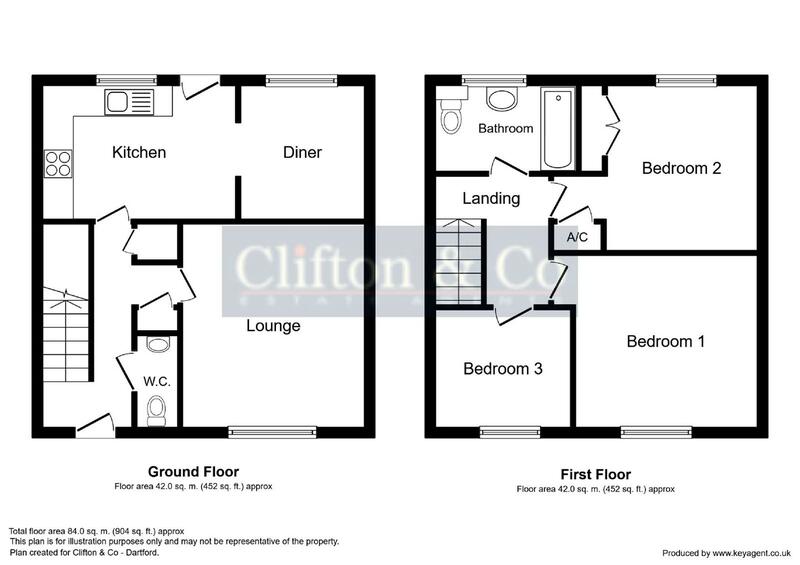 We are informed this property is in band C. For confirmation please call Dartford Borough Council on 01322 343434.